This was my first top-down sock project. 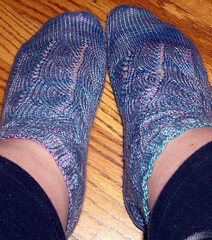 I did the lace pattern all the way down the front of the sock instead of stopping at the heel. The yarn is luscious and perfect for the simple lace pattern. The top-down construction method was easy; the only problem I had was with the kitchener toe. Lovely. I hope you get some wear out of them. Thanks! I've worn them twice so far. They are thinner than my standard socks so I think wearing them in tighter shoes will help; they make my feet slide around in my standard shoes. Maybe I should rethink my neutral-color sock wardrobe. It took me a while to decide to knit socks because I thought "Why spend all that money and time on something I can buy for $5?" But then I tried anyway. And I found that having socks that I knit myself completely delights me. Fun colors are a bonus. They look too beautiful to wear. Maybe save them for special occasions only. Thanks - I think I won't be wearing them for dog walking any more, but I'm generally not a "save things for special occasions" kind of gal. I would rather be regularly delighted by something even if I don't get to keep it for long than to set it aside (where I tend to forget about it). Thanks. They really are kind of shiny! I noticed on your ravelry entry it says these are your first top-down socks. Could you recommend a good, easy to understand toe-up pattern to someone who has only made top-down? I've tried the Wendy's Toe Up pattern that comes up in google and my brain doesn't get it. 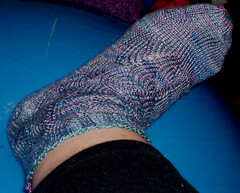 I have some koigu that I want to make the tallest socks possible out of, so I'd like to give toe-up another go. I use a mishmosh of patterns, but I do really like what I've come up with in the combination. I use the "magic cast on" method, and usually cast on a total of 20 stitches. Then I increase to size according to the size charts in Sensational Knitted Socks. If I use a stitch pattern, it's usually from SKS. I use the short row heel from SKS, but use the wrap pickup technique from misocrafty (http://misocrafty.squarespace.com/journal/2006/9/21/short-row-heel-tutorial.html), which results in hole-free heels. In terms of binding off, I have mostly used the Zimmerman sewn bind off, but I've also used the bind off here: http://www.grumperina.com/knitblog/archives/2006/06/so_i_knit_him_a_1.htm which results in a pretty loose cuff. Those are totally squee-worthy! I love pretty socks (which is something, because in general, I don't like socks). Lovely! Both the pattern and the yarn are yummy. 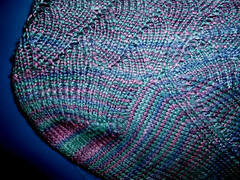 that's a gorgeous pattern, a pretty yarn, and it looks like they came out well! They look fabulous and comfortable! Thanks! They came out really soft.